Combining Dynamic Vapor Sorption (DVS) and Raman spectroscopy allows for a better understanding of vapor-solid interactions between materials as it relates to structural properties. Raman data in conjunction with our patent pending speed of sound sensor now reveal these complex moisture and organic vapor-induced structural changes as a routine experiment. When light interacts with a material some of that light is reflected, some is absorbed, and a small fraction is scattered in different directions. This scattering is known as the Raman Effect. Raman spectroscopy detects and measures the wavelength and intensity of light scattered by molecules. Raman scattering is specifically light that is scattered at a different wavelength than incoming light. This is due to vibrations in molecules or optical phonons in solids, making Raman spectroscopy a great technique for studying crystal lattices and intermolecular vibrations. Raman spectroscopy is also ideal for use in Dynamic Vapor Sorption experiments for a number of reasons. First, the technique is straightforward and only requires a laser to irradiate the material and collect the scattered radiation with a detector. Second, Raman spectroscopy requires small samples (typically a few milligrams), with minimal preparation, like typical DVS samples. Therefore there is no added sample preparation. Notably, glass and stainless steel are common sample holders for Raman spectroscopy, making DVS sample pans ideal for this spectroscopic technique. This specific project was carried out with the help and collaboration of the BAM Federal Institute for Materials Research and Testing in Germany. The unique Speed of Sound organic vapor measurement technology of the DVS Resolution allows for real-time measurement of vapor concentration while the UltrabalanceTM precisely records the mass change. Combined with the DVS Resolution’s new 5 megapixel-200x optical zoom camera, new material properties and processes can be studied as never before in DVS instrumentation. The above high definition microscopy photos allow for a more intuitive understanding of the DVS kinetic data generated by the DVS Resolution. 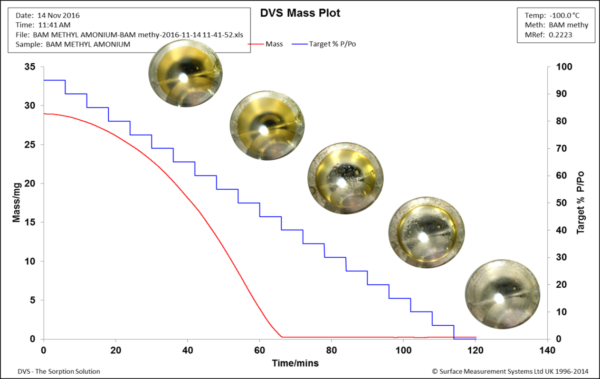 Below, the photographic data collected by the DVS Resolution is superimposed on the mass loss plot during the drying process. 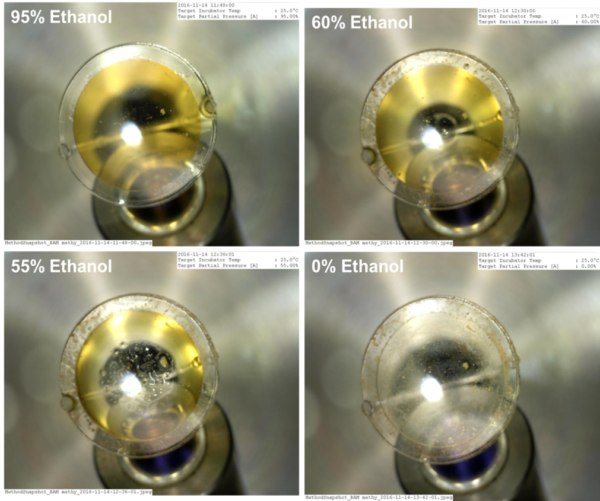 The experiment clearly illustrates the crystallization kinetics of an ethanol soluble catalyst as the vapor concentration of ethanol decreases from 95% P/Po to 0.0% P/Po. This study highlights a new feature in our DVS and Raman software collaboration with B&W Tek. The ability to remove background organic vapor noise from the collected Raman spectrum is of crucial importance when distinguishing between polymorphs of a single compound. 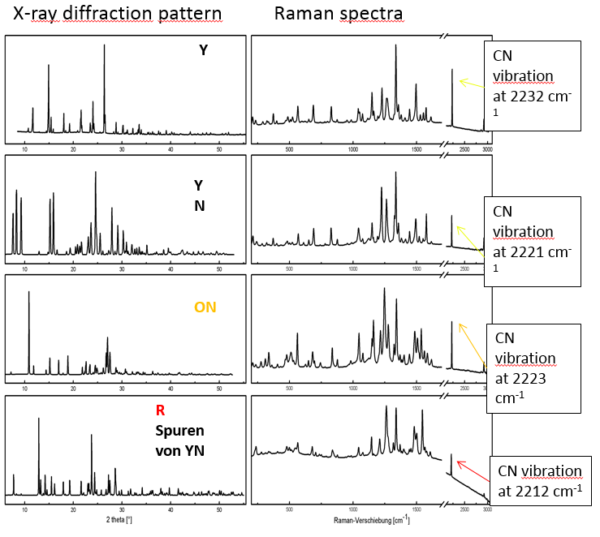 The first figure below shows the Raman spectra of four different polymorphs for ROY ( Y, YN, ON, R). These can be differentiated by investigating the CN vibrational band between 2200-2300 cm-1. 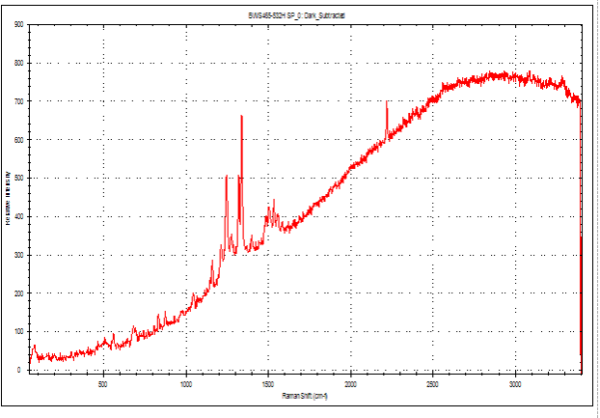 Figure 4 shows the Raman spectra collected using the DVS Resolution. The graph contains background from the organic vapor used during the experiment. 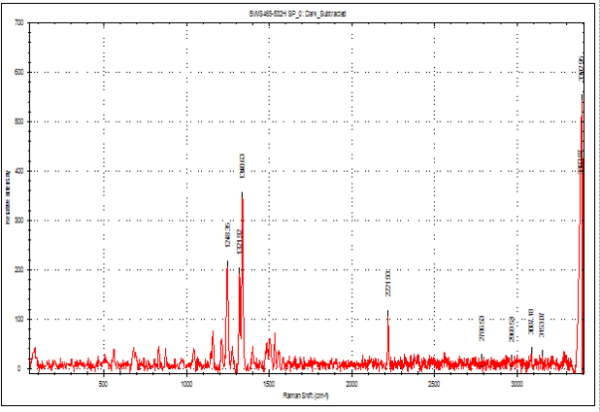 In collaboration with B&W Tek, we’ve developed software for removing this background Raman spectrum, leaving only the data from the sample, shown in Figure 5. With the background removed the CN peak is clearly visible at 2221 cm-1. indicating the unknown YN polymorph. Figure 5 – Raman spectra with background vapor removed using B&W Tek probe with DVS Resolution for an unknown ROY polymorph. The peak at 2221 cm-1 indicates this is the YN polymorph. If you are interested in learning more about using the DVS Resolution with a Raman probe please contact our application science team at [email protected].